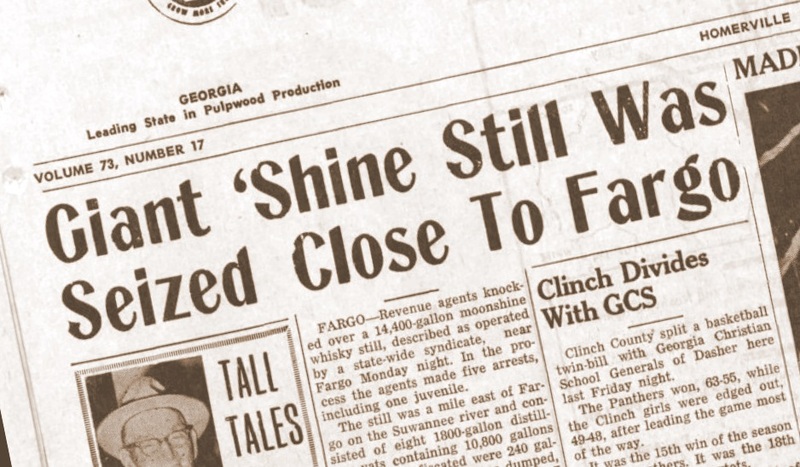 Clinch County News reports giant moonshine still busted, January 29, 1967. FARGO –Revenue agents knocked over a 14,400-gallon moonshine whiskey still, described as operated by a state-wide syndicate, near Fargo Monday night. In the process the agents made five arrests, including one juvenile. The still was a mile east of Fargo on the Suwannee river and consisted of eight 1800-gallon distillery vats containing 10,800 gallons of mash. Confiscated were 240 gallons of liquor, which was dumped, a 1963 model pickup truck with 7 butane gas cylinders, a 1962 luxury automobile, and thirty 60-pound sacks of sugar. Arrested and charged with manufacture of the non-tax paid whiskey were Ray Jackson Cribbs, 29, Lyons, Ga., James Lenten Parrish, 27, Vidalia, Ga., Oscar Delmar Ogilvie, 44 College Park, Ga., a 16-year old Fargo youth, and Jim Steedley, 66, of Fargo. The still was capable of producing 1,920 gallons of moonshine a week at a cost to the taxpayers of $28,800 which is the amount of taxes the government is cheated of in the sale of that much whiskey, according to W. W. Davis, regional supervisor for the Georgia Dept of Revenue. Participating in the raid, according to Davis, were state agents K. D. DeVane of Lakeland, W. D. Gillis of Pearson, J. H. Touchton of Ray City, Federal agents from Valdosta, and Sheriff Charlie Smith and Deputy Lawton Allen. Warren said the site had been under observation for several days. He said investigation shows a state liquor syndicate has started moving its operations in this south Georgia area. “There are some big operators back of this thing,” he said. 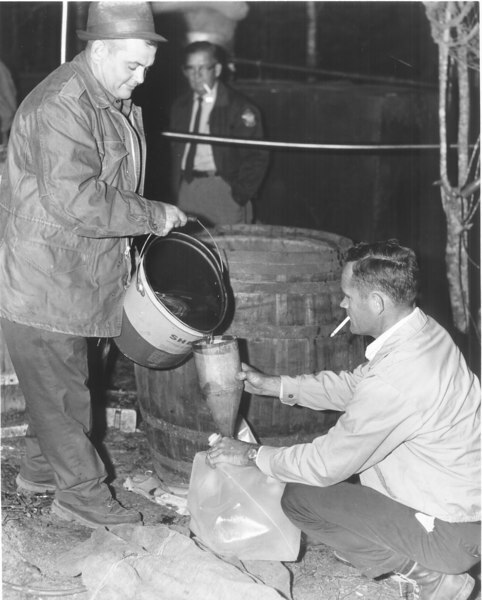 The big bust of 1967 was at Fargo, GA but State revenuers worked also worked their share of moonshine stills in and around Berrien county. 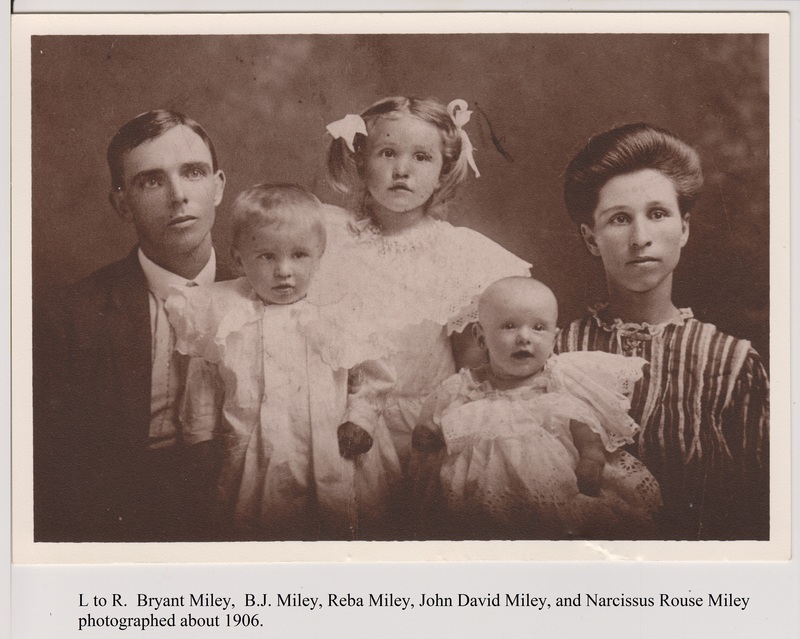 For a brief period in the late 1890s, Dr. Bailey Fraser Julian, Jr. made his practice in Rays Mill, GA (nka Ray City). A fire on the night of Monday, October 3, 1898 burned out his drug store and office. 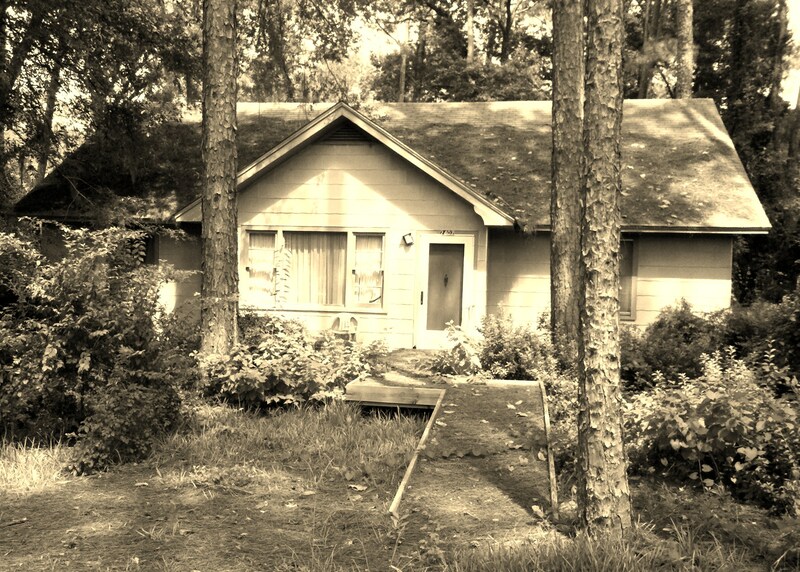 Dr. Julian’s property was partially insured by Briggs Carson, a Tifton businessman who was an investor in the Waymer-Moore Telephone Company, among other interests. Tifton, Ga., October 6. -(Special. )- The drug store and office belonging to Dr. B. F. Julian, at Ray’s Mill, was destroyed by fire Monday night last. Dr. Julian was away from home at the time and the origin of the fire is unknown. The loss was total and included a lot of clothing in the office. The loss is estimated at between $1,200 and $1,500, on which Briggs Carson of Tifton, carried insurance amounting to $800 in the Commercial Union. Dr. Julian was born in June 1864 and raised in Vickery’s Creek, Forsyth County, Georgia. He was a son of Bailey Fraser Julian and Stella Johnson Clement. It appears that sometime after 1880 B.F. Julian, Jr. came to south Georgia. In 1890, Dr. Julian married Theresa Elma “Tessie” Swift. She was born September 19, 1869 in Wisconsin, and as a child had moved with her family to Clinch County, GA.
As a young man, Dr. Julian moved to Archer, Florida where he established his practice as a doctor and surgeon. From 1895 to 1897 Dr. B. F. Julian was a member of that Florida Medical Association. 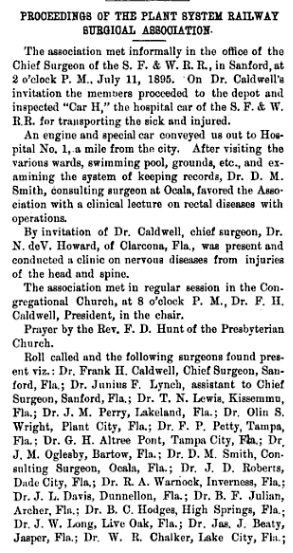 In 1895 he became a charter member of the South Florida Railway Surgeon’s Association which, according to the International Journal of Surgery, held its organizational meeting at Gainesville, FL in April of that year. In 1897, Dr. Julian tendered his resignation with the Florida Medical Association as he had moved his residence from Archer, FL to Tifton, GA. It appears that shortly thereafter he opened his business at Rays Mill. After the 1898 fire that destroyed his Rays Mill store and office, Dr. Julian moved to the Dupont District of Clinch County, where he and Tessie were enumerated in 1900. 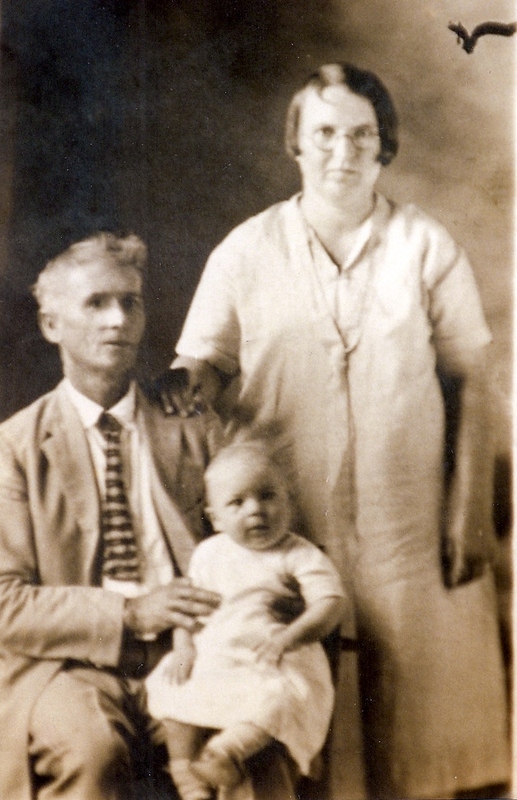 About 1903, Dr. Julian moved back to Archer, FL. He apparently suffered from an extended illness and died on the 27th of March 1907. His obituary ran in the Gainesville Sun. Information reached this city Friday of the death of Dr. B. F. Julian, about forty-nine years of age, who passed away at his home in Archer Tuesday night. The remains were taken to Stockton, Ga., where the interment was held. Deceased was well know in this section, where he resided for many years. 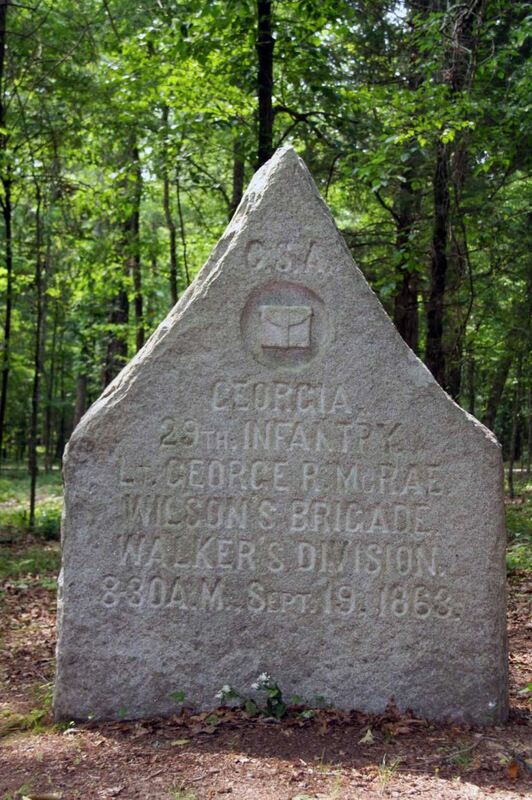 He was formerly a physician at Archer and enjoyed a good practice, but later went to Georgia where he was engaged in his profession for a number of years. He returned to Archer, however, about four years ago, where he has since resided. 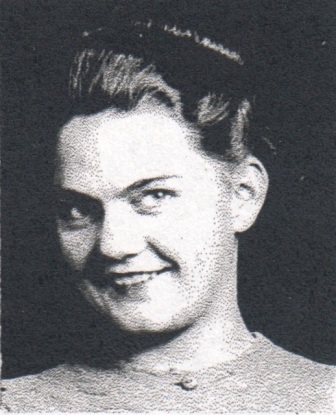 Dr. Julian is survived by a devoted wife, to whom the sympathy of The Sun and friends is extended. 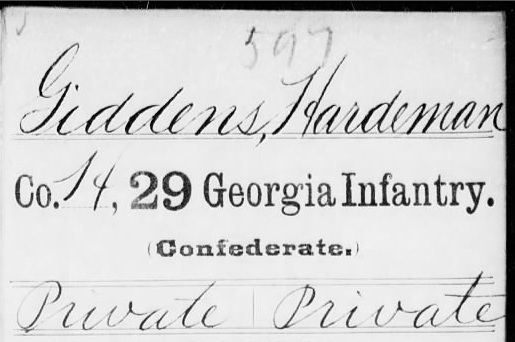 Another note about Hardeman Giddens, Civil War veteran and extraordinary citizen of Berrien County. 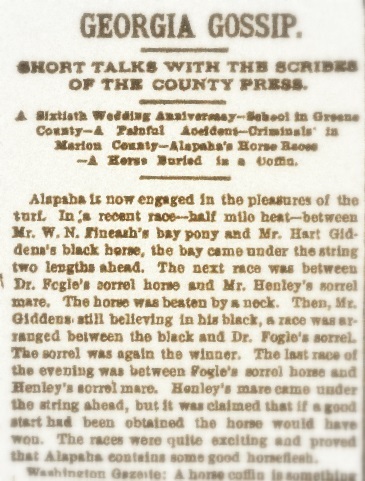 Giddens, a son of Jacob Giddens and Sarah Ann “Annie” Sirmans, had a farm near Rays Mill. He was born in March of 1844 in Lowndes (nka Berrien) County, Georgia, and lived to see the town incorporated as the city of Ray City, GA.
TIFTON, Ga., December 16. -(Special. )- There was a big fishing frolic in Berrien county a few days ago, and thousands of the finest bream and trout were caught and carried away by all who attended. 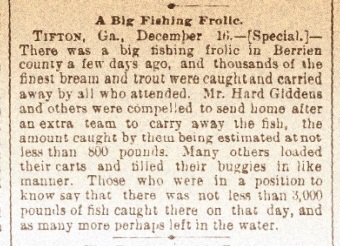 Mr. Hard Giddens and others were compelled to send home after an extra team to carry away the fish, the amount caught by them being estimated at not less than 800 pounds. Many others loaded their carts and filled their buggies in like manner. Those who were in a position to know say that there was not less than 3,000 pounds of fish caught there on that day, and as many more perhaps left in the water. A Big Fishing Frolic. 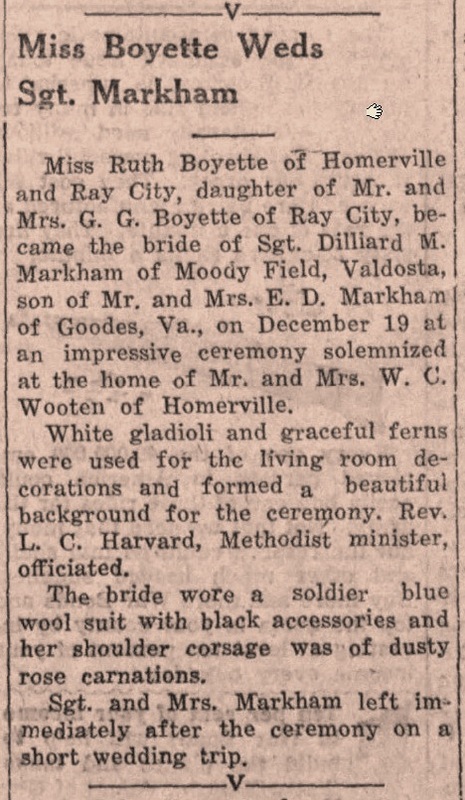 Dec 17, 1891.